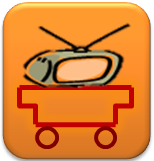 Enabling a Digital Life...: Dear TV Trolley, RIP! It’s quite interesting to reflect, how evolving technologies impact the business of home furniture. Be it phone tables, hi-fi music systems ensconced in the safety and compactness of a wall unit or Television trolleys. I still remember the year 2005, when I bought my first 21 inch Cathode Ray Tube (CRT) TV, ONIDA Black. Buying it from an online shopping portal was much easier than searching for a befitting TV trolley (Back in 2005, I did not come across any online shopping portal that sold home furniture). And trust me, the joy of watching those colorful satellite channels soon faded when the reality of buying the TV trolley from a brick & mortar store struck me. From locating a shop in NOIDA’s (Uttar Pradesh, India) atta market (local lingo for Sector 18 Market in NOIDA) that sold TV trolleys, to choosing the right trolley was an arduous task. I had to bear in mind the mental map of the apartment floor plan, that decided the length X breadth X height of the trolley and also the other factors like weight of the TV; future upgrade projections like, if it is supportable for 25 inch/29 inch TV; cost benefit analysis of custom built versus off the shelf; with wheels or without wheels; glass & steel versus wood & laminate; match color of the trolley with TV or home décor; additional utility as VCD/DVD player stand etc., all these weighed heavily on my purchase decision. The experience drained me so much that I wrote an e-mail to V Chandramouli, then VP Marketing & Sales, MIRC Electronics, requesting them to bundle TV trolleys with TV, as an optional standard accessory. Now I do not exactly remember the content of his reply e-mail, but I vaguely remember him mentioning that they would contemplate this request for 29 inch TVs.